RIOT police yesterday blocked Gweru lawyers from marching in protest against the alleged absence of rule of law and lack of independence of the magistrates’ courts. The legal practitioners under the Gweru Lawyers’ Association banner sought to voice concern over the blanket denial of bail by Gweru magistrates to MDC MPs arrested after the fuel price hike protests. They also intended to protest against the degrading treatment of youths, accused of public violence during the Zimbabwe Congress of Trade Unions protests, including their being denied bail. However, armed riot police, with water cannons, swooped on the lawyers at a hotel in the Midlands capital and forcibly dispersed them. Gweru Lawyers’ Association spokesperson, Esau Mandipa, told NewsDay Weekender that police had been duly notified of the march on Wednesday January 30 as per requirements of the law. “We condemn the behaviour of the police because they violated our right to peaceful demonstration,” Mandipa said. He also said the lawyers intended to hand a petition to provincial magistrate Charity Maphosa and regional magistrate Pathekile Msipa, outlining the breakdown of rule of law and the lack of independence of the courts. “We have since postponed our march to Monday. We will not rest until the rule of law and independence of the judiciary is restored. You cannot have a blanket denial of bail for all MPs when their circumstances are obviously different. It’s unfair at law,” Mandipa said. MPs who have been denied bail at the Gweru Magistrates’ Courts are Amos Chibaya (Mkoba) and Livingstone Chimina (Chiwundura), while Lloyd Mukapiko (Redcliff) and Settlement Chikwinya (Mbizo) faced the same fate at Kwekwe Magistrates’ Courts. 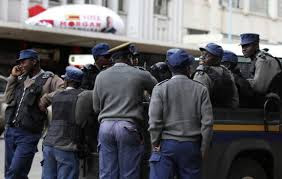 Midlands police spokesperson Inspector Joel Goko was unavailable for comment, while national spokesperson Assistant Commissioner Paul Nyathi said the Harare office was yet to get a briefing on the Gweru incident.